The roots of the Friends of Moccasin Bend National Park go back to 1920, when Adolph Ochs, publisher of The Chattanooga Times and The New York Times, offered to put up half of the cost of preserving Moccasin Bend. That effort was shelved, but other citizens over the years tried to protect this unusual piece of land. Mrs. J.W. (Nell Evans) Johnson, Judge Will Cummings, Mayor Ed Bass, Paul J. Kruesi, Mrs. Alex (Charlotte) Guerry, Dr. Wilbur Butts, Lou Williams, Cartter Patten and Elizabeth Patten, Mrs. Robert (Margaret Kruesi) Killebrew, Sherman Paul, and Sophia Long were among those who rallied to save the Bend. In 1950 Congressman J.B. Frazier introduced National Park legislation to set aside 1,400 acres on the Bend. Unfortunately Gov. Frank Clement in his first day in office in early 1953 refused to issue the necessary $100,000 check on behalf of the state of Tennessee, and that initiative failed. 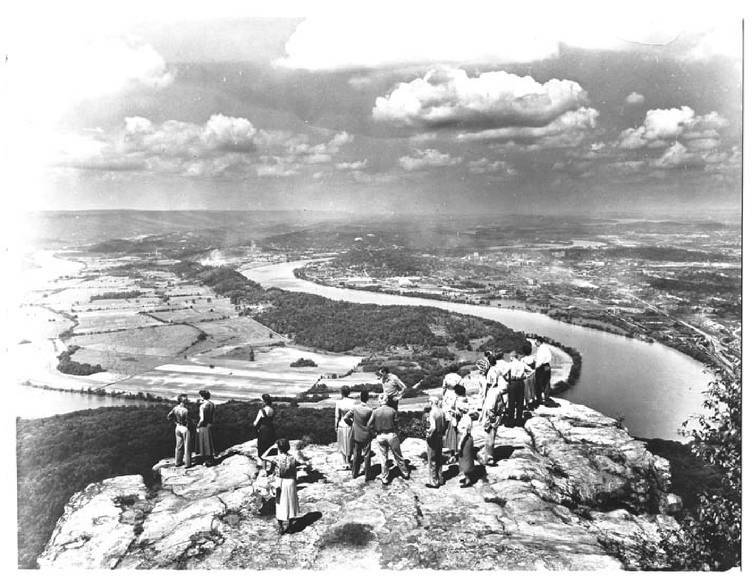 Citizen support for a national park coalesced again in 1995, when the board of the Moccasin Bend Mental Health Institute formed what became the Friends of Moccasin Bend National Park. Early members included Jay Mills, Dan Saieed, Pope Holliday, Karen Diamond, Sally Robinson, Meg Beene, Becky Browder, Bob Hunter, Tom Decosimo, Mike Mahn, Adele Hampton, Jack McDonald, Leighton LeBoeuf, Terry McIntosh, Don Drennon-Gala, Tom Kunesh, Neil Thomas, Karen Stone, Beth Wamp and Mickey Robbins. The Friends met with U.S. Rep. Zach Wamp late that summer. He agreed to make protection of the Bend one of his signature projects and began an eight-year effort working with elected officials, Native American leaders and local citizens to achieve national park status. Congress passed and President George Bush signed legislation in 2003 bringing the Bend into federal ownership. The Friends expanded its roster to include Eleanor Cooper, Bob Doak, John Edwards, Becky Gregory and J.Ed Marston as well as Executive Director Shelly Andrews and consultants Bobby Davenport and Dr. Duane King. In late 2005, Greg Vital, president of Independent Healthcare Properties (now Morning Pointe Assisted Living and Memory Care), made a major gift to the Friends that launched an educational and historical awareness program through lectures to support development of the park. The Friends of Moccasin Bend National Park merged this year with the Friends of Chickamauga and Chattanooga National Military Park to form the National Park Partners with a mission to preserve, promote and enhance the resources of the newly expanded park. With its various components at Chickamauga, Missionary Ridge, Lookout Mountain, Orchard Knob and Signal Point, the Chickamauga and Chattanooga National Military Park is one of the nation's outstanding legacy park units. Moccasin Bend, the first and only National Archaeological District to be so designated in the country, is the newest addition to the park. Moccasin Bend's rich history of Native America life began in Paleolithic times and was followed by Mississippian era, Creek and Cherokee habitation, the Indian Removal and the Trail of Tears. Union artillery on Stringer's Ridge and Confederate cannons on Lookout Mountain exchanged shellfire during October 1863. A Chattanooga Times editorial in the 1940s proclaimed that a park on Moccasin Bend could be as great an asset for Chattanooga as "Central Park for New York City, Hyde Park for London, the Champs Elysees for Paris, the Corso for Rome, or the Prado for Madrid." Today's National Park Partners is committed to fulfilling that promise. The National Park Service recently completed a General Management Plan Amendment, calling for the development of the "Gateway Site" at the entrance on Hamm Road. Within the next year, residents and visitors can expect to find a new parking area and pavilion, along with a welcome kiosk and information about the Park's two trails on Moccasin Bend — the Blue Blazes Trail and the Brown's Ferry/Old Federal Road Trail. New wayside exhibits along Blue Blazes are also in the works. All this is facilitated by the generosity of the Benwood, Lyndhurst and Tucker Foundations, which, with the city of Chattanooga, contributed to the federal Centennial Matching Program that creates public-private funding opportunities for enhancing visitor experiences at National Parks. If you haven't visited Moccasin Bend lately, or the other Park areas mentioned above that make up your Chickamauga and Chattanooga National Military Park, National Park Partners invites you to explore those "national treasures" in our backyard. Learn more about the Partners' mission, events, and programming at www.npp-ccm.org. Frank "Mickey" Robbins, an investment adviser with Patten and Patten, is a board member of the National Park Partners. For more visit Chattahistoricalassoc.org.